When Mohit told Ashok and I in Jan 2004, that a new cluster manager would join in Feb and that we would like him… We didn’t know that we were to meet a lifelong friend. We also didn’t know then that all three of us will be in the same city, as we celebrate ten years of our friendship and two of us celebrate ten years in Aon Hewitt. We did so many things in those early years, from setting up various committees, food, R&R, transport, to managing town halls and all managers meets. Remember the hiring sprees and how I accused you of having rose tinted glasses and you accused me of black tinted ones :). The many fights with Mohit and the deep conversations at the food court in Mega Mall. And ofcourse the look on Mohit’s face when he saw a particular dinner bill from “Shalom” …. He never got over that one. You also will never be forgiven for ensuring that Ashok went off to the opposite building and I went off to the third floor while you sat on the 5th floor. So many memories come by, of when Artell was so mesmerized hearing your voice that he asked you to repeat the question :), of sneaking off to Haldirams and Benu calling to find the two of us stuffing our face, the numerous debates on whose good Karma it was that Benu married you, the jury on that one is out still, but I stand on my position that it’s your good Karma. Ordering the ship shaped cake for Prithvi’s first birthday, eating breakfast at your house before going to Noida and making the blunder of stopping your mom from serving you another poori :), to now asking you to bring masala paneer, the days when you led your all women aerobic class and Vaishali corroborating that, to the famous early morning cycle ride when my pedalyatri friends thought I was lost, and the time that you came riding and took the cycle back in the car, what days we have had !!! While I call you my step brother, in reality you have been more my brother than if I were born with one. Can’t forget the prayer sessions for dad, the many mornings that you chanted for him as I held the phone next to his ears, bringing Vijaya Mami into our lives, your Buddhist philosophy helping us cope with several different situations, and the many coincidences – the most recent one being that I celebrated my 10th work anniversary in Bangalore and so are you and Ashok is right here. Lord Pandit – some of my South Indian habits have rubbed off on you and yes, some of your Punjabi genes have rubbed off on me. Fair exchange. Please forget the Namboodari tie-up for Ayza and stick to your original plan for a Tam-Bram connect… More chances of that working out. Ok I won’t fight with you today, just today. At work, you have been a pillar of support, pun un-intended :), but really, I never had to hesitate to ask for advice or help or just a venting partner. I did not have to watch my back and we worked as a team. Not just with Ashok, but with Satya, Meenu, Narinder, Srini, Kashiana, Uday … So many people that make Aon Hewitt such an awesome place to work. As you celebrate a decade today with the organization, many congratulations and wish you many decades of a super successful career. 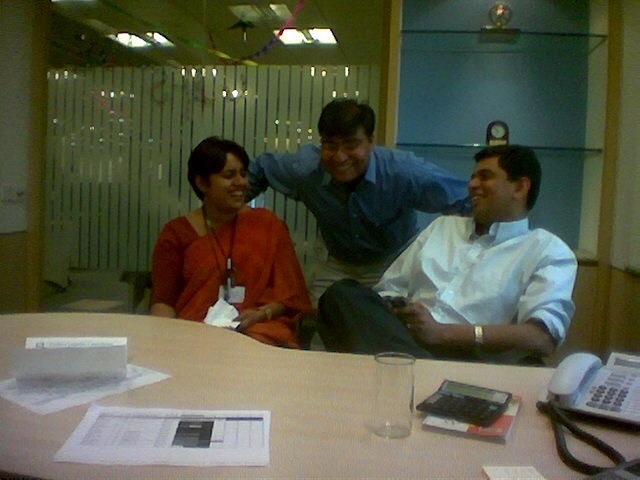 Here’s a picture that was taken ten years back by Mohit… He called us “A” team, which we were, and we continue to be “a team”. Congratulations step-brother ! My dear friend what you haven’t mentioned is your goodwill which attracts the fan following. You make life long friends because they see and benefit from your inherent helpful nature. I don’t know of many people who will fly on personal expense to meet sick colleagues, or set up funds for supporting acquaintances! You completely own CSR at our place of work. Am perfect Kabir, just need Anita Ratnam’s looks :):):):). Reference – one of our Mega Mall conversations. Please don’t ask me how I stumbled upon this blog, I’m just glad I did… and pardon me for commenting, just couldn’t resist writing. It’s been a pleasure knowing both of you. Thank you for writing this blog and sharing the other side of Kabir. Gentleman with lot of finesse, yet very grounded!! Thanks Pawan. 🙂 Kabir is a wonderful human being, undoubtedly.